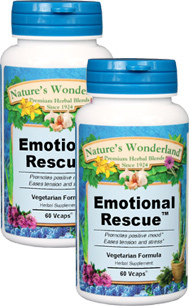 Emotional Rescue™ - 575 mg, 60 Vcaps™ each (Nature's Wonderland) - Penn Herb Co. Ltd.
Get off the emotional roller coaster with our calming, balanced herbal blend. Emotional Rescue™ relaxes and promotes an elevated sense of well-being and inner contentment. This soothing blend also calms the nervous system. Get back on the fast track to feeling good again! St. John's Wort, Black Cohosh Root, Gotu Kola, Kava Kava Root; Plant Cellulose (Vcaps™) - vegetarian capsules. As an addition to the daily diet, take 1 or 2 capsules three times daily with water at mealtimes. NOT TO BE USED DURING PREGNANCY OR WHILE NURSING. AVOID PROLONGED EXPOSURE TO SUNLIGHT WHILE USING.